Note: We apologize for the delay on this product. Our Quality Assurance Team is currently screening for a clean lot of this item. Should be back in the store by end of June 2019. We do appreciate your business with us and your patience while we complete this process. New Super Strength 12MG Health Ranger's Hawaiian Astaxanthin™ Once per Day formula! This new product has the highest potency levels of Astaxanthin per gel cap available on the market today. 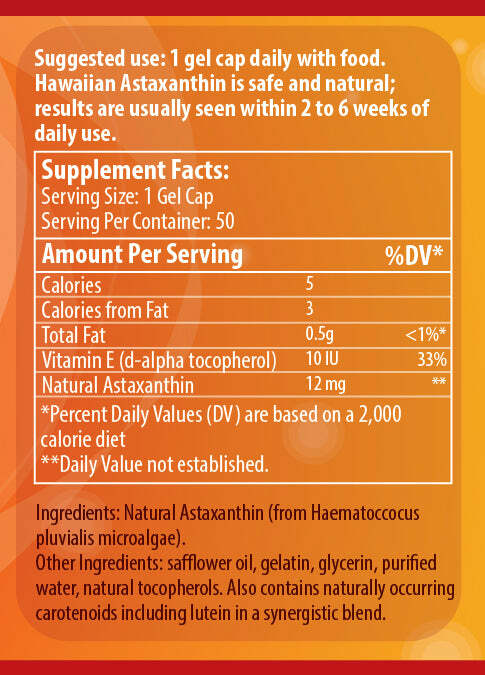 Astaxanthin is known as nature’s most powerful antioxidant; backed by over 200 scientific studies. This new formula is ideal for athletes or individuals with certain health conditions. Explore More About Health Ranger's Hawaiian Astaxanthin Now! This is FREE of gluten, lactose, pesticides and herbicides. It’s Non-GMO and BSE-Free. Other ingredients: Safflower oil, gelatin, glycerin, purified water, natural tocopherols. Also contains naturally occurring carotenoids including lutein in a synergistic blend. This is FREE of gluten, lactose, glyphosate and herbicides. It’s Non-GMO and BSE-Free. With Chief Originals Ahiflower Softgels, you get all the health benefits of omega fatty acids in one plant-based supplement. Each softgel contains a well-balanced combination of omega-3, omega-6 and omega-9 fatty acids that supports optimal immunity, vitality and overall wellness. It's made from ethically grown ahiflowers, the richest non-fish source omega fatty acids on the planet.